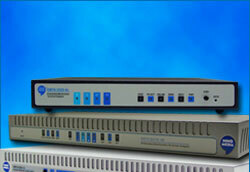 Equipped with an internal backup battery, an external UPS port, and a gigabit LAN port, InnoMedia’s EMTA 9528-4B offers business friendly, feature-rich, primary line VoIP solutions supporting PacketCable NCS 1.5 with DOCSIS™ 3.0 ready cable modem with 8×4 downstream/upstream channel bonding and 24 UGS SIDs. Designed for DOCSIS 3.0 cable networks, InnoMedia’s EMTA 9528-4B is an embedded 4 voice port eMTA device that offers MSO’s an excellent opportunity to deliver revenue generating telephony and broadband services to their customers. 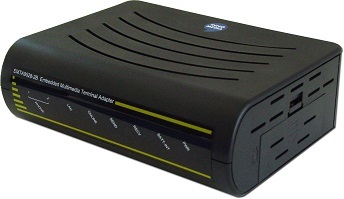 It has rich set of telephony business features including ground start/loop start and OSI for business PBX’s, foreign voltage detection to allow house wiring and prevent accidental connection of house wires to live PSTN, T.38 and G.711 fallback fax support, reliable Bell103/212A modem transmission for credit card reader information transaction, and RJ11 DC open loop for loss of voice link indication to allow alarm triggering. Additionally, EMTA 9528-4B supports PacketCable 1.5 NCS Signalling. It also supports PacketCable 1.5 provisioning, and a wide variety of call features including Caller ID, Call Waiting, Call Forwarding, Call Return, Caller ID Blocking, Call Trace, Automatic Callback, as well as device based 3-way calling. The EMTA 9528-4B is equipped with an internal battery supporting up to 4 hours of continuous talk time for all 4 telephone lines and 8 hours standby time. It also has a UPS port to connect to external UPS batteries to allow service provider to offer primary line voice services. An Internal and External Battery lED indicates when the internal or external battery is in-use, charging, fully charged, faulty or bad.